Guess what, guys?! Cucumber water? So-so. But I think this is mainly because of three things: 1.) I put way too much cucumber in, and 2.) I let it “steep” for too long before drinking it, so that basically it tasted like I was drinking a cucumber, instead of cucumber-flavored water. 3.) I have just recently become appreciative of cucumber as a food. I previously only ever used cucumber in order to reenact scenes from “Don’t Tell Mom The Babysitter’s Dead” (if you have never seen the movie, this must sound like it has the potential to be really perverse and titillating, but I promise it’s not). So, you know, I kinda like cucumber, I guess. Next time, I’m going to use blood oranges, which I know I like, and see what happens. Also, I will probably use less fruit, and not let it sit as long either. There’s a certain Greek salad that has been making the rounds where I work. By this I mean Dimitri (who is the only actual Greek involved) made it for Esther, Esther made it for Kristen and for me, and then Esther also made it for her roommate, Paul, and then made a different version again for Kristen and me. And I just finished making another variation, which I am taking to work tomorrow for Esther and me to share. That’s how delicious this salad is. I’ve eaten it twice this week already, with another round coming up tomorrow. Esther, I’m pretty sure, has eaten it almost every day for the last two weeks. IT’S THAT AMAZING! Take: oil & vinegar (3/1 ratio or just use a store-bought vinaigrette), tomato, cucumber, onion, green pepper, feta cheese crumbles. Slice all the vegetables up, add the feta cheese, toss in oil & vinegar, then add generous amounts of oregano, as well as salt & pepper. Toss until everything is well-coated in vinaigrette, and then store in the fridge overnight to let everything marinate. Then take a loaf of french bread or whatever your pleasure and use this to dip in/scoop up salad. My variation: Although I love what they do when they’re together, I don’t actually love all the involved vegetables, so up until now I’ve mostly been nomming down on the dressing-flavored bread bits and feta cheese and onion. So I went ahead and made some pasta, which I then rinsed to cool before adding it to the vegetables and mixing everything as above. 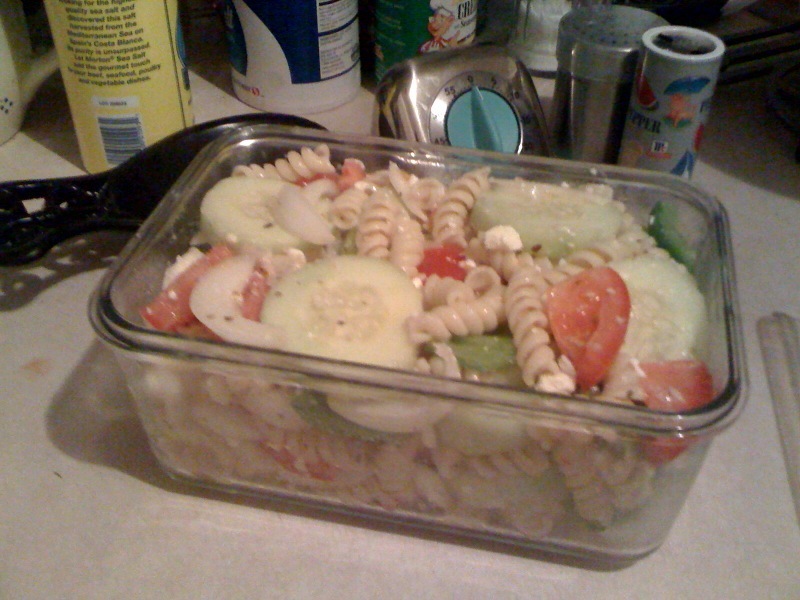 So what I’m taking to work tomorrow is basically greek pasta salad – I used extra virgin olive oil, which website after website said was perfectly okay to do with a vinaigrette, but having taken a little taste already, this may still turn out to be a mistake. After my cucumber water debacle, I guess we’ll just have to wait and see. it just tasted pretty olive-y, which might be okay, it’s just not something that has been present in any of the other versions we’ve had. I’ll keep you posted!